This past week, we honored our 3rd selected Student of the Month for the 2018-2019 school year. 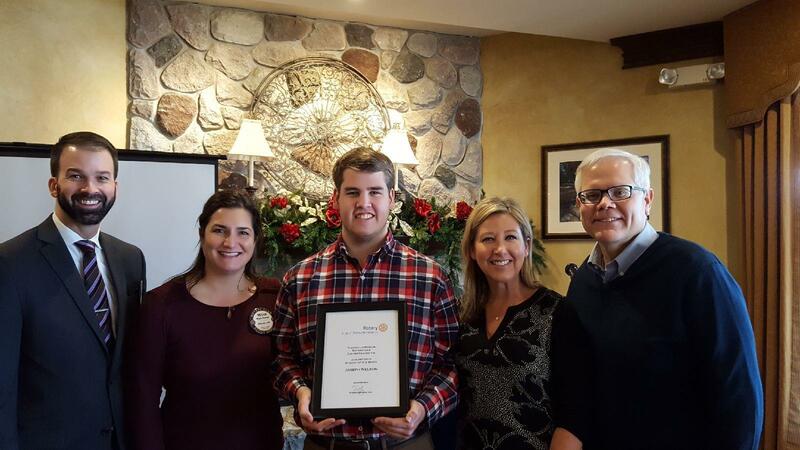 Joe Nelson, a senior at Homestead High School, was the selected winner and was honored during our club meeting on Tuesday, January 8, 2019. Joe was accompanied by both of his parents, Eric and Lisa Nelson of Mequon. Joe Nelson is certainly no stranger to taking action to help others within his community and school. 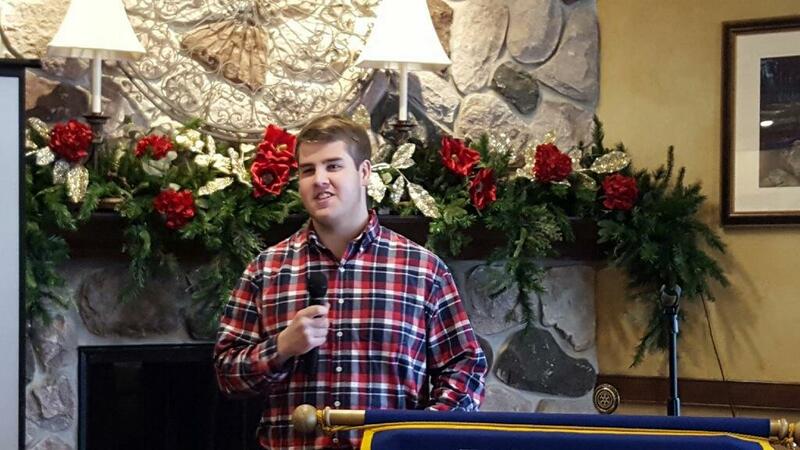 Joe has an impressive resume, filled with several community, church and school related volunteer activities, clubs, band, and leadership positions. One of Joe’s most significant service accomplishments is his involvement with the Best Buddies Club at Homestead. Joe is now the president of this organization, leading 60 members, and has spent the last 3 years as a Peer Buddy. Best Buddies is an organization dedicated to creating one-on-one friendships, employment and leadership development for individuals with intellectual and developmental disabilities. Joe has been paired with the same buddy for all 3 years, an individual who has non-verbal autism. Joe has learned how to communicate with his buddy, created a special friendship, and helped improve his peer’s social and communication skills. Joe’s experience has developed a passion for caring for other people and ultimately, has prompted him to explore a career in the medical field. Joe is a 4-year Merit Award recipient at Homestead, a member of the National Honor Society and represented Homestead at Badger Boys State. He has participated in his church mission trips for the past 4 years, traveling to New York, New Jersey, Washington DC, San Francisco and Minneapolis to name a few. Joe has also served as the percussion section leader for the past 3 years at Homestead. He is involved in marching band, symphony orchestra and the jazz band. He also plays the pit orchestra for the Homestead musicals. He is the co-founder and co-president of Homestead’s Investment Club. Joe is still in the process of deciding where he will attend college this fall, but does intend to study nursing. Joe, we congratulate you on your accomplishments and thank you for all of your “service above self”.